Status: Rare casual spring migrant west, accidental east. Fairly common regular fall migrant west, rare casual central. Documentation: Specimen: UNSM ZM12011, 19 Sep 1911 Crawford, Dawes Co.
11-12 Jun 2002 Sioux Co (Silcock 2002). Wintering Townsend’s Warblers are mostly restricted to the Pacific Coast from California to Oregon, and in spring migration move up the coast (Dunn and Garrett 1997). This results in rarity in spring east of the Rocky Mountains; there are, however, small numbers wintering in interior California and Arizona (Dunn and Garrett 1977) that may account for the few spring records on the western Great Plains. There is an earlier report 14 Jul 1965 Lincoln Co of a male observed for 45 minutes near North Platte (Nielsen 1965), and later reports 18 Oct 1991 Scotts Bluff Co (Grzybowski 1992) and 11 Nov 1972 Perkins Co. A report of one at Oliver Reservoir, Kimball Co, 22 Oct 1997 was not accepted by the NOURC (Brogie 1998). 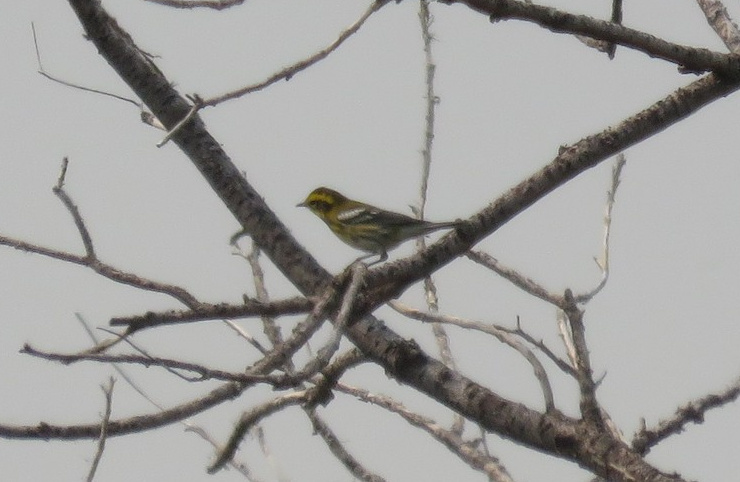 Townsend’s Warbler is far more numerous in fall than in spring; records are essentially restricted to the Panhandle. There are sightings east to the west-central: 14 Jul 1965 Lincoln Co (see above), 17 Aug 1966 Lincoln Co, 1 Sep 2018 Dundy Co, 2 Sep 2001 Grant Co, 17 Sep 1972 Perkins Co, 28 Sep 1973 Perkins Co, one photographed 28 Sep 2012 Lincoln Co, 29 Sep 2014 Lincoln Co, and 11 Nov 1972 Perkins Co.
High counts: 9+ at Oliver Reservoir 31 Aug 2000, 7 in Banner Co 1 Sep 2000, 5 at Bushnell Cemetery, Kimball Co 20 Aug 2001, 5 there 17 Sep 2010, 5 at Oliver Reservoir 1 Sep 2001, 5 at Gering Cemetery, Scotts Bluff Co 6 Sep 2012, and 5 at I-80 Exit 1 on 2 Sep 2018..
A total of 53 were reported 22 Aug-20 Sep 2000. Five were netted in Garden Co 30 Aug-11 Sep 1979 (Williams 1980). Photograph (top) of a Townsend’s Warbler in Banner Co 4 Sep 2017 by Michael Willison. Cortelyou, R.G. 1989. 1989 (Sixty-fourth) Spring Occurrence Report. NBR 57: 59-80. Neilson, W.H. 1965. Excerpts from letters. NBR 33: 66-67. Silcock, W.R. 2002. Summer Field Report, June-July 2002. NBR 70: 94-119.